When I built my miter saw stand, I made a bin for underneath it to throw all the scraps into. That bin has been full for a few weeks but I wanted to do a project with it’s content before sending it to the burn pile. So here is a project idea to use up some of the scraps laying around your shop. It’s a very quick and easy project that would be a great beginners project to get the wife involved in! You can use the same concept and do a whole lot of different things with it. Something like this could make a very good DIY Christmas, Birthday, or even Wedding present. 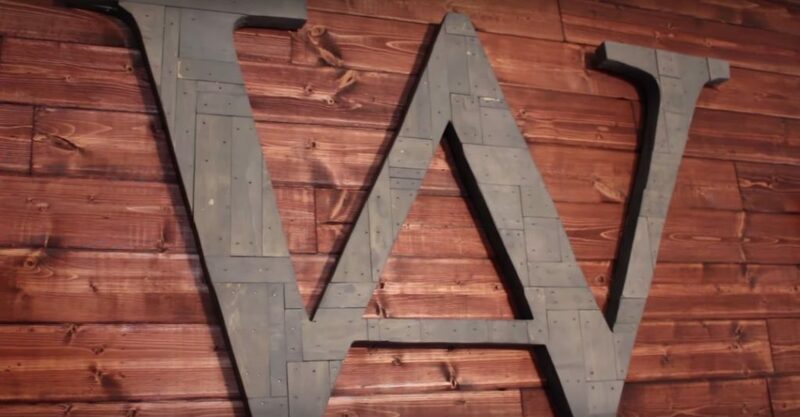 So my husband’s family brand is a W with the middle turned into an A and it’s just a cool coincidence that my name is also an A, so my initials are AW as well. I had been wanting to do something for above the fireplace and thought the brand was perfect. First thing I did was grab a scrap piece of 3/8″ plywood and draw out the brand to the size I wanted it. An alternative to drawing your letter/image out would be to use a CNC machine, a projector, or even pay Office Depot/Staples for a large print out (that way you can cut it out and use it as a template). Then I cut it out using a jigsaw. Next I went to my scrap bin and gathered up all my small scrap 3/4″ plywood pieces and just started laying them down. I started at the top and worked from left to right. I would vary the direction, but I tried not to put too much thought into it because I really wanted it to look random. I would get a small section done then pick them up a few at a time, and smear down some glue using my Rockler applicator. Then I came back with my brad nailer and nailed the pieces down (using 1″ nails). Note: If you don’t like the way the nail holes look then you can use glue and weight the pieces down while they dry. After the entire AW was covered I waited an hour to let the glue dry. Then I flipped it over and used my jigsaw to trim the edges flush. Even though I waited until the glue was dry, I still had two pieces pop off while I was cutting so I picked them up off the floor and glued/nailed them back into place. With all the edges cut, I came back with some sandpaper and made sure they were all nice and smooth. For a finish I decided on a weathered grey stain, since this will be going on a wood stained wall. I used a brush to apply the stain but only let it sit for 30 seconds or so, before wiping it off. I wanted to give it some color, but not hid the cool pattern. To get the sides easily, I placed the piece on some bench cookies then used a foam brush. To hang it, I hammered a picture frame hanger on the back then hung it on a screw above my fireplace. : ) I might have to do a few more pieces using this concept. I’m in love with the idea of doing a very large tree and staining it brown.